​​ ​AUSTIN – H-E-B has signed a long-term lease at 2416 E. 6th St. to develop a world-class tech facility and innovation lab. The recently renovated industrial warehouse will become a creative and collaborative workspace for employees of the H-E-B digital team and Favor's corporate headquarters. The two-story, 81,000-sf facility is set for completion spring 2019. 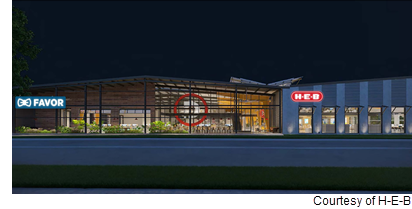 H-E-B and Favor plan to add several hundred jobs to the local economy and are hiring in product management, product design, and software engineering.